When large numbers men start to have fertility problems, you know there is something wrong with the environment. For a long time, scientists were unsure this was really happening. However, repeated studies have confirmed that male sperm counts in Western continents are 59% lower than they were in 1971. They are now directing their attention to possible reasons why. What they’ve found should make men more concerned about their use of over-the-counter drugs. A recent study published in Proceedings of the National Academy of Sciences has found that when men use ibuprofen on a regular basis, it can lead to hypogonadism. This is a condition normally seen only in elderly men, but researchers were able to induce it by giving men two 600 mg tablets of ibuprofen daily for several months. When they administered the ibuprofen directly into testicle samples (provided by organ donors), testosterone production declined in just 24 hours. Luckily, testosterone levels rose again once the study ended, so the problem can be reversed – at least when ibuprofen is taken only for short periods of time. However, scientists are now concerned about the many male athletes who take ibuprofen on a daily basis to control inflammation and pain. 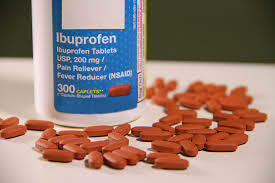 Ibuprofen is one of the most widely used medications, and larger doses of the drug, taken for years at a time, may make this condition irreversible. The hypogonadism generated in the study seems to have occurred because of increased production of luteinizing hormone by the pituitary gland. When luteinizing hormone increases, it causes a relative reduction of testosterone, leading to infertility, erectile dysfunction, fatigue, depression, and loss of bone and muscle mass. This is not the first time that ibuprofen has been implicated in fertility issues. In a previous study, women who took ibuprofen during pregnancy gave birth to boys with impaired testicular development. Concern has also been raised over the safety of other over-the-counter drugs, such as acetaminophen. In addition to its tendency to cause liver damage when taken in high enough doses, acetaminophen has been linked to an increased risk of behavioural issues and ADHD among children when mothers take it during pregnancy. Another study found that people who used acetaminophen to control pain had reduced empathy, and other positive emotions. We’ve always known that drugs come with some negative side effects. But which side effects are we prepared to accept? At what point do the negative consequences of these drugs outweigh their potential benefits? Many herbs have valuable pain-relieving and anti-inflammatory properties, with fewer, if any, side effects. To save our environment, and ourselves, we need to start using these more natural options. If you have any questions about how to use our tinctures to reduce pain and inflammation safely, please write us at rebecca@sensiblehealth.com, or give us a call at 416-248-2930. I am 71 yrs old and have an L4, L5 issue with my lower basck and due to the pain I take 1600 mgs. of ibuprofen a day with my breakfast and with my dinner. This regimen has helped me get through the days since I hurt my lower back two years ago. My sister a retired physician said that my dosage is ok as long as I take the medication with food. My doctor satated to me that my dosage was ok as long as I do not exceed 2400 mg a day. So with all the negative side effects what is a man supposed to do? Chronic pain is really difficult to manage, and I’m so sorry that you’ve been struggling. There are some things you can do to try to reduce the amount of drugs you are taking. My mother-in-law struggled with arthritic pain for years and found a few things to be very helpful. By doing them, she was able to avoid taking drugs and eventually got rid of her pain for good. Even now, at the age of 75, she is pain-free. I will email you with some suggestions.